Here are a few photos from recent seasons. See more pictures from previous seasons on the Gallery 2 page. 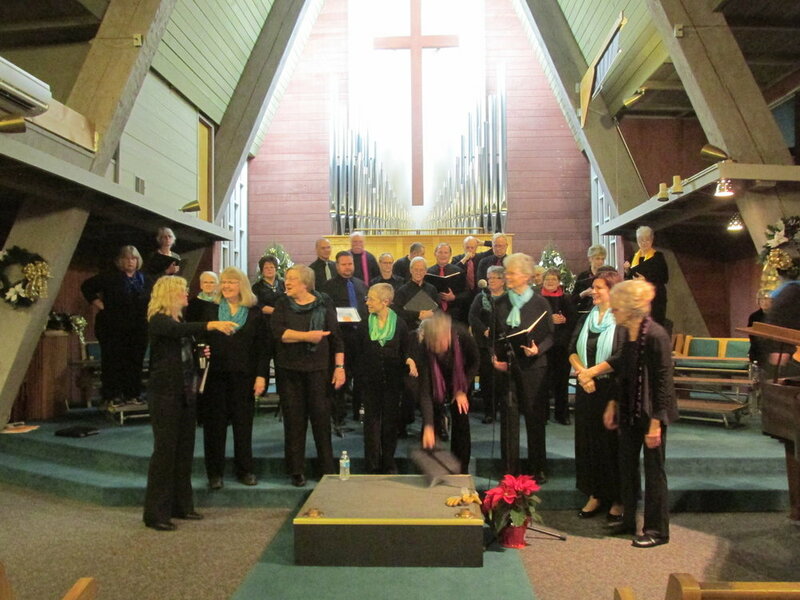 The choir performed their annual holiday concert three times in December. We started in Lincoln City at the Cultural Center. We had a very nice crowd. Since we had done the big Beethoven concert in September, the music committee chose a selection of shorter, lighter pieces to perform for these concerts. We sang some lively pieces like Sleigh Bells by Earlene Rentz and Gaudete arranged by the King’s Singers member Brian Kay. We sang some beautiful pieces like Morten Lauridsen’s Sure on this Shining Night and Eric Whitacre’s Lux Aurumque. And we sang a fun resetting of a traditional Christmas carol with A Musicological Journey through the Twelve Days of Christmas. Thanks to everyone who laughed. The next weekend we repeated the show in Yachats on Saturday and took to the big stage on Sunday at the Newport Performing Arts Center. For that last show we even added a small orchestra! It was fun singing with horns and harps and cellos. 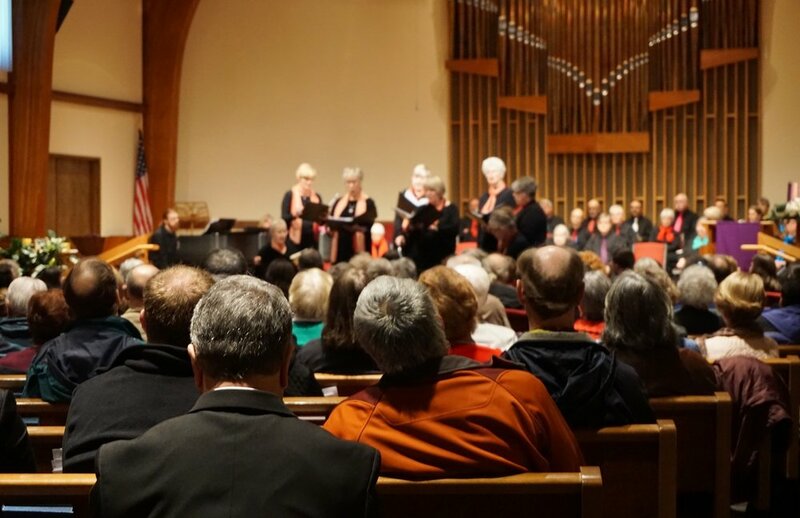 Women of Note joined us, as always, with a couple of madrigals, a beautiful lullaby and a fun piece about what goes into everybody’s favorite, the Christmas fruitcake. At the end of September 2018 we joined with the Newport Symphony Orchestra, the Corvallis Repertory Singers, and the Willamette Master Chorus to perform Beethoven’s Glorious 9th. Over a hundred singers combined with the orchestra to produce a marvelous wall of sound that got rave reviews from attendees. We performed the concert twice, once in Newport at the Middle School gym—we simply couldn’t all fit on the stage of the Performing Arts Center—for a sold out concert, and again the following day in Corvallis at the LaSells Stewart Center. It was so exciting to join together with Steven Zielke, Paul Klemme, and our own Mary Lee Scoville under the baton of Adam Flatt to perform this classic of all classics. We loved being part of this amazing weekend. Every December we perform our annual Wishes & Candles Concert of holiday music. This year we had three wonderful concerts, one each in Lincoln City, Newport and Yachats. We had great houses for all three. Newport and Yachats both required us to scramble a little bit to make sure everyone had a place to sit. A singing group really can't get higher praise than to find themselves with sold out houses. We'd like to thank everyone who came out! Our concerts featured some great pieces. We sang two movements of Poulenc's Motets for Christmas, and the last movement of Pinkham's Christmas Cantata. We experimented with a double choir set up in Ola Gjeilo's arrangement of In the Bleak Midwinter. We got loud and happy with Sing We Now of Christmas and got the audience to join us singing the Silent Night part of Dark is the Silent Night. Forrest Fisher stepped out from the tenor section to perform triple duty for us. He played sax and flute on two pieces and in Yachats he conducted the tenor bass piece, Soon and Very Soon. Women of Note were outstanding as usual. They invited David Sampson to sing a tenor solo with them and Derek Jefferson played classical guitar on La Nana and he and Tiffany Jefferson added handbells to another piece. Milo Graamans did his usual stellar job of accompanying us in Lincoln City and Yachats. He had a prior commitment for Thursday evening so fan favorite Ramona Martin stepped in without even one rehearsal to handle the piano that evening. Absolutely amazing. An amazing talent and a lovely person. As always, thanks also to Mary Lee for managing our little circus. We got through a lot of music and had fun along the way. Kudos! Photos of our small, women only octet, Women of Note from over the years. Some faces stay the same, some change, and the hair is always different!